Here's a fantastic Jackpot game from Eyecon Gaming. Escape the dreariness of everyday life with this colourful slot by Eyecon. Everything about its cheerful design exudes joy and optimism! Step into a luscious green field dotted with vivid flowers and bask in the warmth of the clear blue sky. A rainbow arcs overhead, completing the idyllic scene. Get more details when you click to see these slots online! Keep an eye out for cute blue birds, bright pink butterflies and smiling daisies who also frequent the field, and if you stick around long enough you might even catch sight of the pink and purple unicorn herself! Stars, moons, suns, and glittering roses will also pop up on the reels. Venture into this picturesque field and leave feeling refreshed and revitalised! Established in 1997, Eyecon is a Brisbane based company with over 100 popular slots in their portfolio. Their expertise is in land-based gaming, yet their online slots are still some of the best on the market. Indeed their latest releases are frequently included in ‘Top 10 Games of the Year’ lists compiled by various gaming platforms. 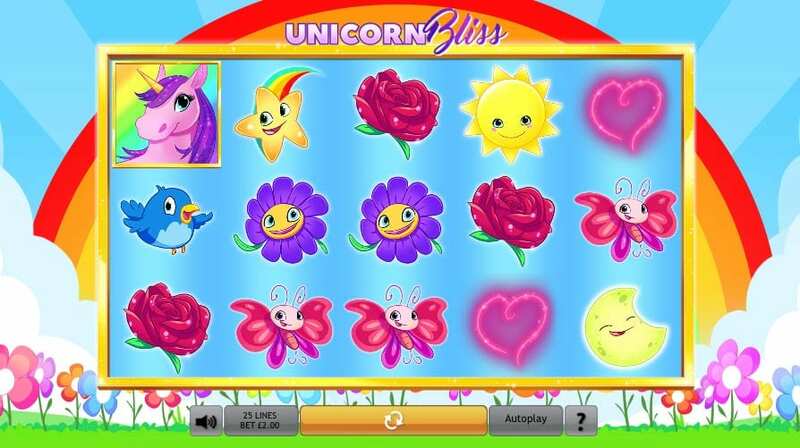 Eyecon has a reputation for cartoon-like design and this is certainly evident in Unicorn Bliss Jackpot. However, the simple and cute graphics only add to the charm of this game. For a similarly cheerful and magical slot from Eyecon, try your hand at Twinkle. Try our slots games from Eyecon today. This is a 5 reel, 25 payline slot, with a total bet per spin ranging from 0.25 to 12.50 credits. It has medium volatility, so you can look forward to fairly frequent wins. We made a helpful guide for new players to look for the best slots for them, click here. The two most important symbols in this game are the Rainbow Wild and the Unicorn Scatter. The Rainbow symbol will substitute in for anything else and double any prizes when it is part of a winning combination. Not to be outdone, the striking unicorn has considerable powers of her own. 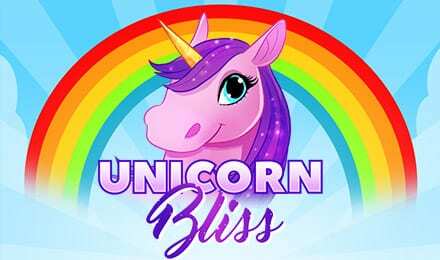 Three or more unicorns anywhere on screen treat you to free spins, with a maximum of 25 free spins available if you see 5 of these beauties at once. 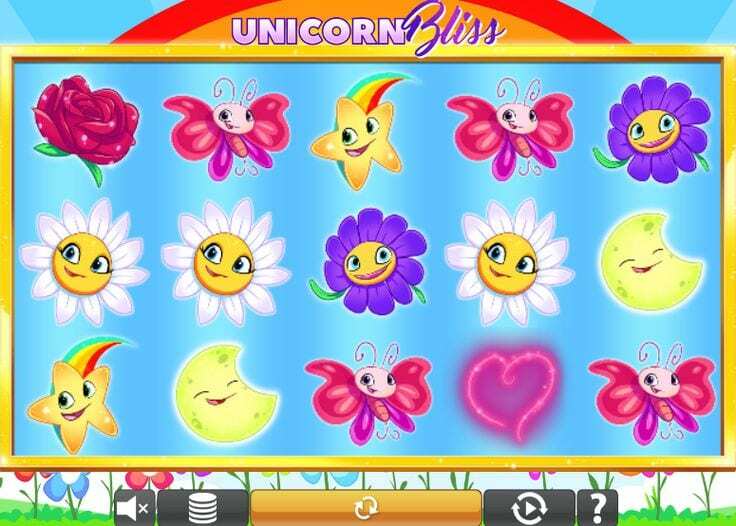 This game retains the loveable charm of Eyecon’s Unicorn Bliss game, but injects it with a bit more excitement thanks to the addition of a progressive jackpot which just keeps growing – who knows how much treasure is lurking at the end of this rainbow! There is a decidedly feminine feel to this slot due to the cute leading characters and pinky purple color scheme. I loved the cutesy feel and the simplicity of the graphics added to the charm. Indeed it is not overwhelming or intimidating, making it a perfect game for those who are relatively new to the world of online slots. Despite the blissful calm of the setting of this game, you are at no risk of feeling bored thanks to the progressive jackpot and free spins! With a total bet per spin varying from 0.25 to 12.50, this is a slot that can be enjoyed by a number of players no matter what their budget.